Calcium with Magnesium, Zinc and Vitamin D.
This product taken 3 times a day provides 100% RDA (recommended daily allowance) of the nutrients Vitamin D, Calcium, Magnesium, Zinc, associated with bones and was formulated accordingly. Most of the body’s calcium is deposited in the bones and teeth but is also required by nerves and muscles. It is a mineral easily lost from the body’s reserves or lost because of poor absorption from foodstuff. Calcium is the main contributor to the skeletal frame consisting of 206 bones which together provide structure, articulation and protection of vulnerable organs. The rate of calcium depletion is much higher in older women so a regular dietary intake is important to ensure reserves are kept at optimal levels. Calcium is equally important for nerve impulse transmission and blood coagulation. Extra Ca+ is easy to take but it would be helpful to know which variety of Vitamin D it contains. Is it D2 or D3; the latter is much better at facilitating the body’s intake of calcium. How much D3 does it contain? According to the British Pharmacopoeia of Medicinal and Pharmaceutical substances, both Vitamin D2 or Vitamin D3 may be supplied when Vitamin D is required; they are interchangeable. At Bio-Health Ltd, we only use Vitamin D3 as this is derived from fungi and so meets our strict criteria for being suitable for people who are Vegan and/or Vegetarian. Conversely, Vitamin D2 is derived from animal sources so we do not use it in our purefil products. Thank you very much for your response confirming that Purefil Extra Calcium Plus contains the more beneficial vitamin D3. As a result I can increase the rating! We must apologise to Mr Anderson as we made an error in our response. The information provided is all correct – Vitamin D2 and D3 are interchangeable according to the British Pharmacopoeia of medicinal products and that Bio-Health only use products suitable for Vegan and Vegetarian customers. The error was that we said ergocalciferol derived from vegetable sources is Vitamin D3. It is in fact Vitamin D2. Vitamin D3 is usually sourced from animals and so we only use Vitamin D2 in our Purefil products. Dear Katherine, I have been handed your communications regarding our products and I am delighted to hear that you have derived benefit from our Extra Calcium capsules, with the results having impressed your Doctor also in relieving your migraine attacks. 1. The Calcium as the active is mined and originates from France. 2. The Vitamin D2 is derived, originally from Fungi, more definitively – Shitake mushrooms or Portobello mushrooms. The Ergocalciferol is produced by a complex process usually involving UV light source. We use this form of Vitamin D so that we can assure Vegans and Vegetarians that the Vitamin D is not derived from animals. Vitamin D3 Cholecalciferol is derived from animals. Furthermore I can assure you that the Vitamin D will not exacerbate any Candida albicans growth that you might be experiencing. Obviously, I cannot make any diagnosis as to whether you are so afflicted, but rest assured Vitamin D2 will not cause any issue in this context. 3. Vitamin B Complex Capsules. I can assure you also that our B Complex does not contain any yeast, living or dried Brewer’s Yeast and once again would be suitable for you to take. I trust I have answered all your questions but should you need further assistance please do not hesitate to contact me. 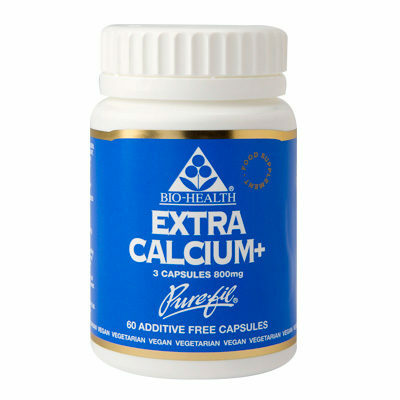 No fillers is really important and this Calcium supplement is one a the few that has none. I also like that it is a balanced supplement with the other minerals. I use it daily to keep me healthy during menopause.